Our project on Allen Avenue is progressing, albeit slowly due to the freezing temperatures we’re experiencing in February. Is it springtime yet? The demolition finished last week and excavation is ongoing. Here you can see the hole that was dug for the basement, which is about eight feet below grade. Always remember to adjust your expectations when building. In a perfect world the work would have taken just three days but, of course, that isn’t always the case. Excavation will take over a week due to the fact that a smaller excavator needs to be used. Access to the site limits the amount of dump trucks that can occupy the street when coming for a pickup. We also had two machines break down during the excavation. Talk about issues! Trying to anticipate and avoid these snags should be a homebuilder’s top priority. They need to anticipate what may happen, or what can hold things up for the next contractor coming in to do their part of the job. Excavation seems fairly straight forward but should be monitored closely, especially if you haven’t developed a working relationship with the contractor. 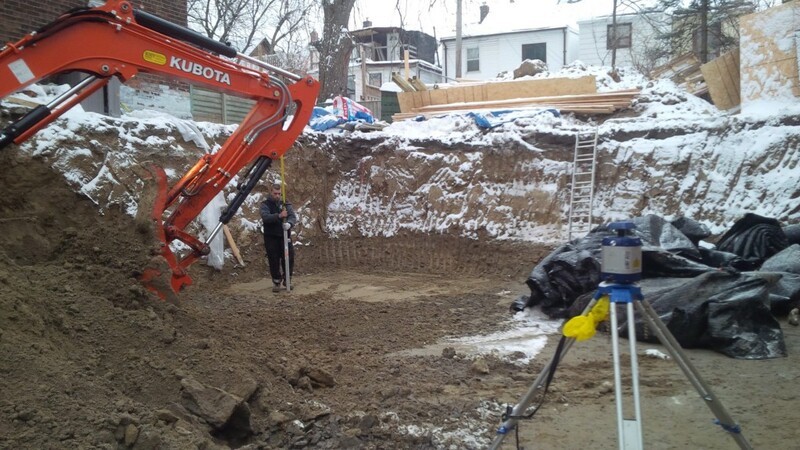 The excavation contractor works to the plans and works to the points indicated by the surveyor. A close working relationship is key, as it allows you to have confidence in each other’s skills. Once the site is excavated the surveyor needs to be called in to stake the house (or mark the outline of the building). The surveyor will indicate where the first floor will start and how deep the excavation needs to be using the first floor as a reference. How deep is the excavation? 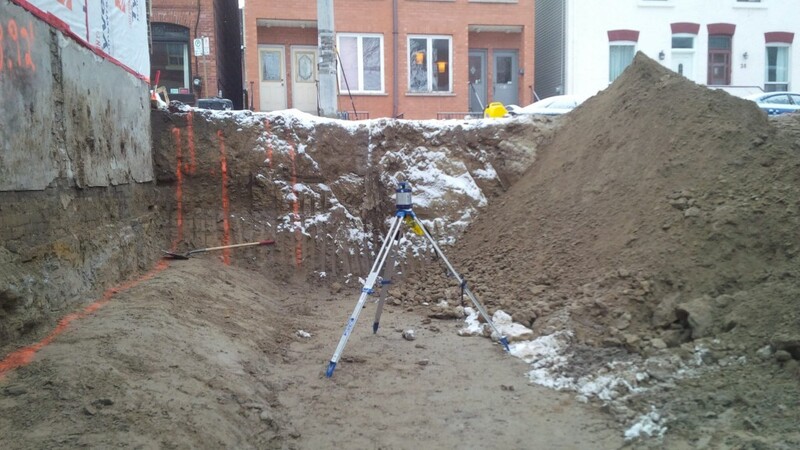 Make sure the contractor is using a laser level, like the one shown here, to ensure the excavation is the correct depth. Be certain there’s enough space between the foundation of the house and the excavation, to allow workers to get behind for the formwork and foundation construction. Should the excavation be sloped to protect workers on site from any danger of collapse? Know the experience level of your machine operators before you dig! You certainly don’t want your operators to cause any damage, over-excavate or damage a neighbour’s home! Can you believe that there were 29 dump trucks of dirt that were removed from this site? That’s almost 300 cubic yards of dirt that was removed! Stay tuned for our next post, where we’ll discuss the next phase of excavation: shoring.